Friendly, elegant Victorian family run guest house. It has twin rooms, double rooms (2 with four poster beds), a triple room and a ground floor room, some with views of the sea or harbour. All the bedrooms are non-smoking and have central heating, drink making facilities, colour television and ensuite facilities with baths and/or showers. Reservations from and to any day. Special terms for children sharing parents’ room. Reductions for senior citizens (out of season). 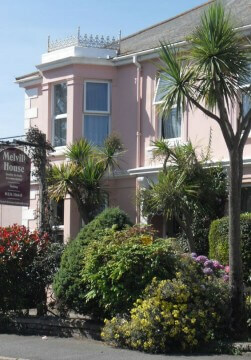 We are about 150 yards from the beach and a short walk from Falmouth harbour waterfront and the shops, pubs, and restaurants. There are four steps to the entrance of Melvill House.